If you could only have one make-up product for the rest of your life, what would it be? For a long time lipstick was the automatic answer; a slick of colour really does give an impression of being fully ‘made-up’ even without using anything else. Because of this, lipstick took pride of place in both our make-up bags and our hearts, and the humble stick of pigments and oil has developed accordingly – the vast spectrum of innovations, textures and colours is dizzying! Lips are still big news, but if you ask the average woman what her must-have product is today, she’ll probably answer “mascara”. It’s no surprise that mascara is a make-up bag essential; it opens and widens the eyes like nothing else, with lash-structuring formulations and intense pigments to give peepers added depth. Eye accentuation is big business, and there are an infinite number of new innovations for the lengthening, curling, volumising and defining of lashes. The panoramic ‘orb’ head of this fabulous mascara means that every single lash can be reached, coated and defined for a wide-eyed look. 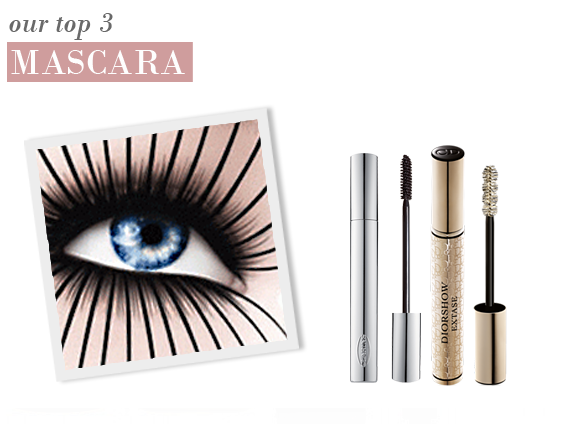 The mascara formulation goes on smooth and silky, curving along every lash without crumbling or weighing them down. Added D-Panthenol fortifies the lashes, making them thicker and more dense for a full and fluttery look that is ideal for daytime. Rich colour, unbelievable volume and a dramatic lengthening effect, right from the first brush stroke. This mascara is perfect for a more intense look, with beautifully separated and plumped up lashes without flakes or clumps. The glossy formulation fortifies lashes with Pro Vitamin B5, is exceptionally long-lasting, and gives lashes a natural intensity that is hard to beat! For a completely extravagant false-lash effect, you just can’t beat the DiorShow range of mascaras. Extase boosts lashes to their fullest with its XXL Couture brush, pulling the innovative formulation through each lash for an immediate plumping effect. Lashes are left full, luscious and very, very big! A gorgeous treat for an unforgettable look. Mascara has a great colour and last for many many hours. Apart from that I wouldn't recommend it, actually I was a bit dissapointed. The eyelashes looks glue together and its difficult to remove mascara from the skin.. This entry was posted on Thursday, October 21st, 2010 at 11:23 am and is filed under Hints & Tips, Make-up. You can follow any responses to this entry through the RSS 2.0 feed. You can skip to the end and leave a response. Pinging is currently not allowed.